TODAY, ANIMAL ELECTRICITY is proving to be more important than anyone ever thought, and Children’s Hospital Boston researcher David Clapham, MD, PhD, is at the forefront of studying it.Put simply, says Clapham, “all cells are batteries,” and fully 30 percent of a cell’s energy is spent keeping those batteries charged. The cell stores up its energy by keeping some electrically charged particles, or ions, inside its boundaries, and keeping other ions out. Clapham, director of Basic Cardiac Research at Children’s and a Howard Hughes investigator, has devoted his career to studying these cellular batteries, particularly the “switches” that turn them on and off. These switches, better known as ion channels, are roughly donut-shaped proteins that straddle the membrane of every cell in the body. They’re the gatekeepers that let ions flow in and out of the cell. Any given cell might have hundreds or thousands of channels. The right stimulus„a messenger molecule, a change in voltage, or even a change in acidity or temperature„can throw a channel open, allowing ions to pass through. As in a battery, opposites attract: positively-charged ions move toward a negative charge, and vice versa, and the surge of ions across the cell membrane generates tiny electrical currents that orchestrate a multitude of bodily functions. First discovered in the 1940s, ion channels have been implicated in a long list of diseases, including cystic fibrosis, diabetes, cardiac arrhythmias, neurologic and psychiatric diseases, gastrointestinal disorders, and hypertension (see figure below). A malfunctioning channel can throw off the timing of a heartbeat, cause a brain cell to “talk” too much or too little to its neighbors, or constrict a blood vessel too tightly. Many drugs on the market today act on ion channels, either directly or indirectly, including Valium, Glucotrol for diabetes, Robitussin cough medicine, and even the hair-loss drug Rogaine. Channels come in several types, based on the ions that tunnel through them: positively charged sodium, calcium, or potassium ions, or negatively charged chloride ions. 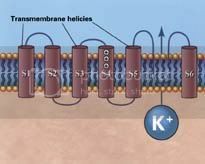 Sodium channels are excitatory, tending to trigger fast physiologic responses; potassium channels are inhibitory, tending to slow things down. Regardless of their effect, the signals that pass through ion channels are lightning fast. Using ion channels, cells continually adjust their inside and outside electrical charges. 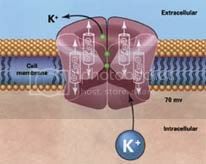 Normal levels of calcium ions, for example, are 20,000 times higher outside the cell than inside. Heart cells, using special voltage-sensitive calcium channels, can quickly upset this ratio, generating the spike of energy needed for a heartbeat. Through the controlled movement of ions across its membrane, the cell returns to its resting state and then recharges its battery to begin the next cycle. Clapham, who originally studied electrical engineering, wants to know what triggers different kinds of channels to open and close, how channels detect these triggers, how channels “know” to let one kind of ion pass but not another, and how they physically open and close. His work began in the 1970s, as the field was undergoing dramatic change. He did his postdoctoral studies in Germany with Erwin Neher, who together with another researcher named Bert Sakmann, would win the Nobel Prize for developing the patch clamp technique. Patch clamping allows researchers to study the real-time electrical behavior of a single cell„and sometimes even a single ion channel„by directly measuring the current. The 1980s brought a second key advance: the ability to clone ion channels and determine the makeup of their genes. This led to an explosion of research, as investigators tampered with ion channel genes„or completely disabled them„to alter the channels and watch what happened. A third revolution came in 1998, when a team led by Rod MacKinnon, a researcher at Rockefeller University, took an ion channel protein (in this case a potassium channel), grew it in crystals with a lattice-like structure, and aimed an X-ray beam through the crystals. The way the X-rays bounced off the lattice revealed, for the first time, the channel’s three-dimensional shape. It was known that ion channels have sensing mechanisms that pick up triggering cues, a pore through which the ions flow, and a selectivity filter that allows only certain types of ions through, but those structures had never been seen. The 3-D, extremely high-resolution images from X-ray crystallography are accurate down to the atom. Clapham praises the work of his friend and colleague, MacKinnon, but adds, “There’s so much more to do.” First on his list is to crystallize the “NaChBac” channel, which his lab discovered and cloned. NaChBac (short for sodium [Na] channel of bacteria) is activated by changes in voltage. If his lab can coax NaChBac to grow in crystals, Clapham hopes that X-ray imaging will reveal, structurally, how the voltage sensor works. It should also reveal the workings of the sodium selectivity filter, which admits sodium but excludes ions like potassium that are very close in size. 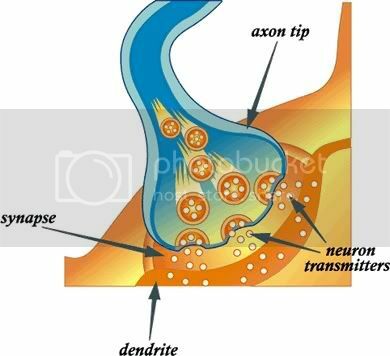 The sodium filter is key to the signaling of “excitable cells” like nerve and muscle cells, which not only use electricity internally but can fire off electrical impulses (known as action potentials) to their neighbors. In Clapham’s lab, and in others throughout Children’s, ion channel research is touching areas as wide-ranging as sickle cell disease, brain development and craniofacial development (see sidebar). But Clapham’s most recent discovery is a calcium channel found only in the tails of sperm. Dubbed CatSper, it provides the wriggle and thrust that propel sperm toward the egg; without it, sperm are incapable of fertilization. Hydra Biosciences, Inc., co-founded by Clapham, is now developing a male contraceptive that would specifically target CatSper. Since CatSper is unique to sperm, Clapham says, such a drug shouldn’t have side effects. Some of the hottest ion channel research involves non-excitable cells: cells with no obvious electrical activity. Clapham is now focusing on a family of channels known as transient receptor potential (TRP) channels. Preliminary research indicates that many TRP channels are involved in sensory functions like smell, taste, hearing, primitive forms of vision and even pheromone sensing. Last year, Clapham’s lab reported that TRP channel TRPV3 is activated by subtle temperature changes. Found in skin, hair follicles, and nerve cells, it may help regulate body temperature. A still-mysterious group of TRP channels seem to influence cells’ ability to move and travel in the body, potentially affecting functions as diverse as wound healing, infection fighting, embryonic development and even the metastasis of cancers. Since ion channels are major drug targets, the pharmaceutical industry has invested heavily in studying them. Clapham and collaborator Dejian Ren, a researcher from the University of Pennsylvania, recently filed a patent application for the use of NaChBac, the bacterial channel, as a template for testing channel blockers and openers. NaChBac is easy to manipulate in the lab. Through genetic engineering, selected channel components can be removed, and their counterparts from human (or other mammalian) channels can be inserted in their place and tested. Alternatively, a sodium channel could be converted into, say, a calcium channel by changing the pore and filter. Such a tool would be convenient not just for drug discovery, but for learning more about how channels work, Clapham says. Yet despite the commercial interest, ion channels are surprisingly under-appreciated by the general medical community. For a start, people who gravitate to life science tend not to be interested in electronics or physical science, says Clapham. And the study of ion channels requires electrophysiology tools and techniques that are unfamiliar to researchers more used to cloning and expressing genes. Lungs In cystic fibrosis, defective chloride channels fail to let chloride ions exit lung cells, so the cells don’t secrete enough fluid. The result is thick, dried-out mucus that clogs the airways. Brain In epilepsy, malfunctioning ion channels disrupt electrical activity in the brain and play a major role in seizures. An electric field inside an embryo may tell it whether to place an internal organ on its left or right side. Robinson, K.R., and M.A. Messerli. 2003. Left/right, up/down: The role of endogenous electrical fields as directional signals in development, repair and invasion. BioEssays 25(August):759-766. Abstract available at http://dx.doi.org/10.1002/bies.10307. 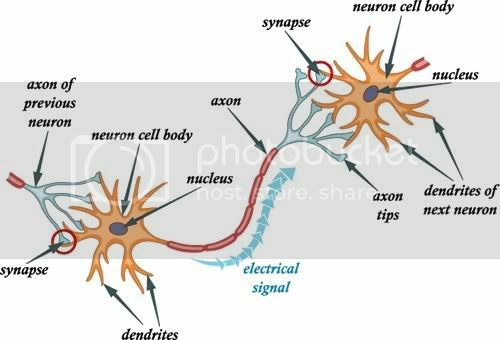 You can use common electronic components to model how nerve impulses get relayed from one neuron to another in the body. 1. Set up the equipment as shown. Make sure the shorter lead of the LED is connected to the black wire of the battery holder. Similarly, make sure the shorter lead of the phototransistor is connected to the red wire of the other battery holder. Wrap a small piece of electrical tape around each connection. 2. You should have two circuits. The circuit on the left contains batteries, wire, and an LED. The circuit on the right contains batteries, wire, a phototransistor, and a buzzer. Electricity travels in a loop called a circuit. Every circuit has an energy source, wires, a load, and a switch. 3. Line up the LED with the phototransistor, leaving about a half-inch of space between them. Then touch the end of the loose red wire to the long lead of the LED. The LED should light up and the buzzer should sound. If the buzzer doesn’t sound, check the alignment of the LED and the phototransistor and then repeat until it does.